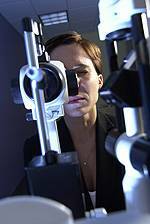 Based on the way the light reflects from your eye during this procedure, your Kelowna eye doctor can get a very good idea of what your eyeglasses prescription should be. This test is especially useful for children and non-verbal patients who are unable to accurately answer the doctor's questions. This is the test your optometrist uses to determine your exact eyeglasses prescription. During a refraction, the doctor puts the phoropter in front of your eyes and shows you a series of lens choices. He or she will then ask you which of the two lenses in each choice ("1 or 2," "A or B," for example) make the letters on the wall chart look clearer.